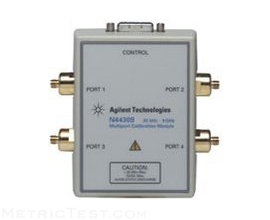 The N4430B four-port electronic calibration (ECal) module is the perfect companion for Keysight's N1900B series physical layer test systems. With a single set of connections, the ECal module cycles through all of the impedance states required for a full, four-port, SOLT (Short/Open Load/Thru) vector-error corrected calibration in under a minute. Not only is the ECal fast, it is also extremely repeatable and accurate. Control of the ECal module is built into the physical layer test system software (N1930A) - the same software that controls the system's measurements and provides all of the time and frequency domain analysis.